I’ve released version 2.2.1 of Weight Tracker ODS, my open source weight loss spreadsheet for OpenOffice.org. Visit my page The Hacker’s Diet with OpenOffice.org for more information. New to this release are charts and signed macros. It also contains numerous bug fixes, the removal of unnecessary options, and a complete overhaul on how trends are calculated. Project renamed from WT2 to WTODS. Replaced Charts button with new Chart sheet. Official (non-trunk) releases have had their macros signed, to protect against malicious tampering. Fixed the bug where you couldn’t see your month’s progress until the next month. Simplified calculation complexity and maintenance requirements by removing morning/evening weights and the buggy “no-carry” option. Fixed trend calculations to better handle starting in the middle of the year. 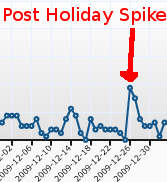 Fixed calculation flaws for maintaining trend data into new years. Fixed calculation flaws regarding leap years. Reorganized dialogs to give more room for fonts on Windows systems. It’s been 21 months since I last updated the spreadsheet, and once I cracked it open for development again, boy did I have my work cut out for me. Thanks to all the feedback about the previous version! The emails and comments really helped motivate me to get this new version out. Lately I’ve been getting a bunch of great feedback on my weight tracking spreadsheet, and even noticed a jump in site hits the day after Christmas. Looks like people are ramping up for their New Year’s resolutions! I’ve been hard at work updating the spreadsheet, reducing the unnecessary calculations that slow the sheet down or cause weird bugs. I hope to have a new version out by next week. But no need to wait, the current version works fine, and there is a “one-click” migration feature so you can easily upgrade to the newest version and not lose any of your entered weights. Go check out the official Weight Tracker ODS site and get started entering your weight today!